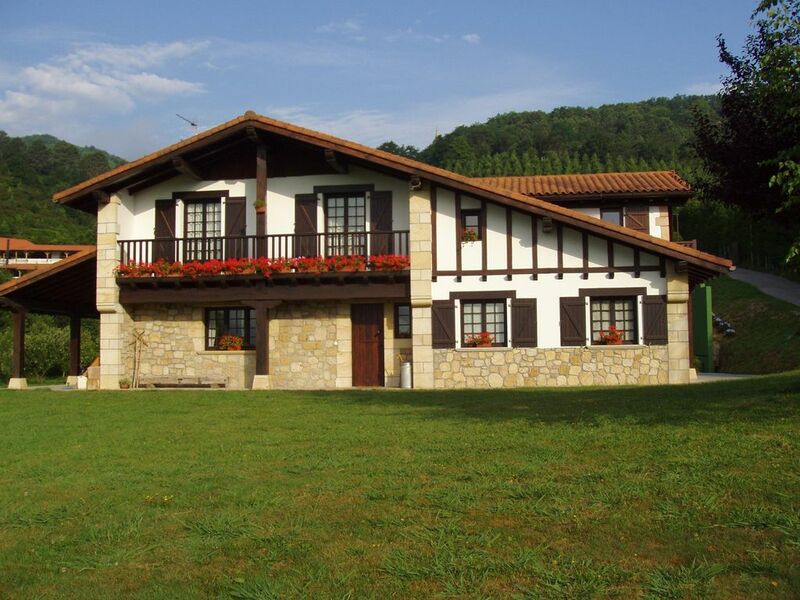 Located in Hondarribia (Gipuzkoa, Basque Country), in a land of 10000m2, built with structure and wooden ceilings. In a very quiet and quiet environment, is surrounded by large green area, trees, irrigation, pediment and parking. Perfect to disconnect and relax. It consists of 100 m2 spread over two floors and has three double bedrooms. On the ground floor it has two bedrooms (1.50 and 1.80 beds), each with its own bathroom and shower, living-dining room with fireplace, TV and kitchen equipped with induction hob, extractor fan, fridge, microwave, coffee maker, kettle, toaster, blender, juice extractor. On the first floor there is a larger room (with a bed of 1.80) with option for a sofa bed, bathroom with shower and balcony. In total, it has room for 6 adults and two children. All rooms and bathrooms have linens, towels and heating. We offer laundry service (1 free wash for stays longer than 4 nights). It also has tables, chairs and hammocks in the garden. And animals such as cats, chickens, dogs, ponies, organic orchards and fruit trees. The house is 2km from the town center and 3km from the beach and the airport. The town of Hondarribia is a village with an old walled medieval part, the Marina neighborhood with many good pintxo restaurants, lighthouse, fishing port, marina and beach. And it is very well located to visit San Sebastian (18Km), San Juan de Luz and Biarritz (20-30Km), the valley of Baztán (50Km), Zarautz, Getaria and Zumaia (30-35Km). Bilbao and Vitoria are at 90Km, and Pamplona at 60.